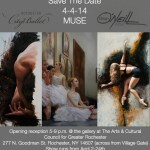 The 2014 Annual Rochester Art Club Exhibition Award Winners! Congratulations to the following Rochester Art Club Signature Members who won awards at our annual Signature member at the Patricia O’Keefe Ross Gallery in the Skalny Welcome Center at St. John Fisher College! The exhibit runs until March 31st. Congratulations to the following RAC members who won awards in the Pittsford Art Group Exhibit at Barnes & Noble, Pittsford: Lynn Wickes who won both a juror’s award and merit award; Kathleen Bolin who won a Body of Work award. The show juror was Patricia Tribastone. The show is up until March 30th. Barbara Jablonski was juried into the 3rd annual Finger Lakes Plein Air Competition at Canandaigua in June. This is the third year she has participated in the competition. Forty four artists from the US and Canada will competition for cash prizes. Patricia Tribastone, PSA has won ‘Outstanding Pastel’ in the January Boldbrush Competition online for her pastel painting ‘ Crayon Vanistas’. 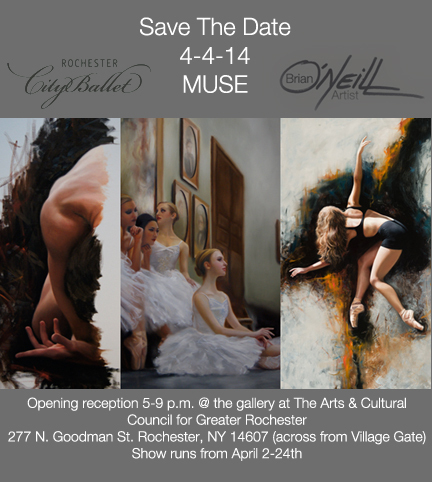 Brian O’Neill’s upcoming exhibit at the Arts and Cultural Council. Show opening Friday, April 4th 6-9pm. Steven Sidare, an Associate Affiliate member of the RAC, has had a jpeg of his work juried into the F & W’s publication, Incite 2, contest book. The book will be published in September of 2014. Congrats Steve!